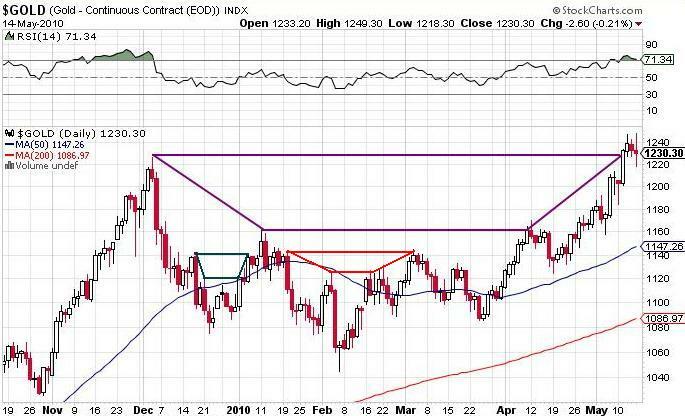 The inverted trapezoid formation heralds the arrival of more new highs for gold, and that’s great news for all gold investors. Here is a chart of gold over the last seven months: notice anything amazing (click on the chart to enlarge)? That’s right, we have a perfect inverted trapezoid formation, arguably the most bullish formation possible. The bottom line on the main trapezoid (in purple) is drawn from the January 10, 2010 peak to the April 10 peak, exactly three months. The April 10 peak, a double top, didn’t hold, and we corrected for six more trading sessions, and then six sessions later gold took out the April 10 peak, and it’s been rising ever since. The top line of this shape is drawn from the peak on December 3, 2009 to the next date that gold achieved the same level, May 11, 2010. That’s exactly 159 days, or exactly 53 times 3. You then simply join the lines together to form the most reliable technical indicator every devised. Three months for the bottom peak. Three times two for the correction, three times two to get back, and then 53 times 3 to get back again. One of the key features of this shape is the preponderance of threes, as we obviously have here. 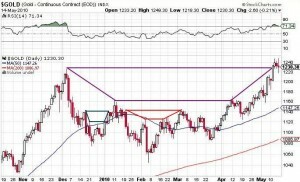 The base to the top of the trapezoid went from $1,160 to $1,230, so a further gain of 6% to the next phase in this bull market is likely, putting gold at $1,303 at some point in the next 159 days, after a correction to set up the next trapezoid. Of course the trapezoid will not always have the same slope, but as you can see from the chart, it’s a pattern that continually repeats itself whenever a double top is made (see the red and green trapezoids as well), so whenever you see this formation it will inevitably lead to higher prices. NOTE: Why are you reading this? I just made it all up! There is no such thing as an inverted trapezoid formation. I just wanted to try an experiment and see if I could rank #1 in Google for a search for the phrase inverted trapezoid formation, which shouldn’t be too hard, since the phrase doesn’t actually exist! And if you look at the chart, you will see that an inverted trapezoid formation doesn’t always lead to higher prices. After the red one prices dropped for three weeks before recovering, so it’s not very predictive. What’s my point? Technical analysis does work, in many cases. However, don’t believe everything you read. Anyone can make up any system they want. Before you blindly follow some made up concept you read on some anonymous guy’s blog, you should probably consider the source, and then back test the data to see if it makes sense or not. But it was fun, because I like to draw lines. All hail to the inverted trapezoid formation!